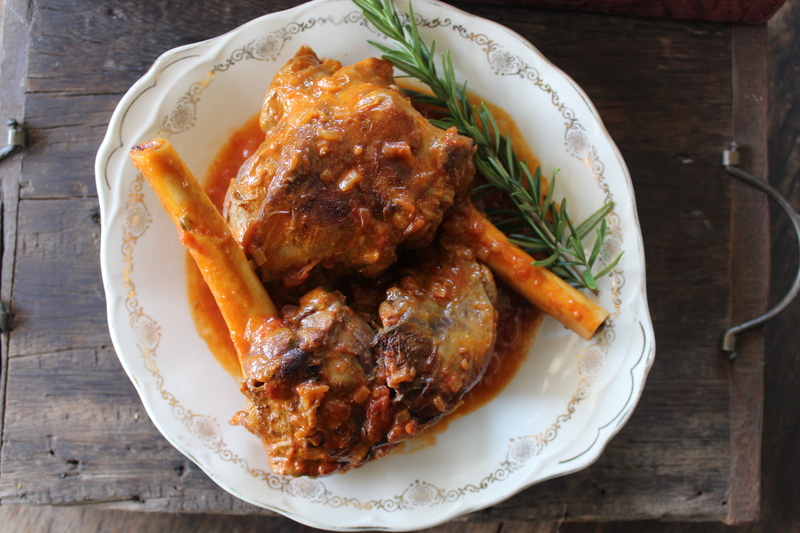 Yudhika’s Greek Inspired Lamb Shanks…. The weekend is here again and I have a action packed one ahead of me! I will be cooking up an absolute storm at the Grand Design Live show at the Coca Cola Dome. If you are popping in, come over to the Curry Me Home stand where we will be hosting quick and easy cooking demos with AMC Cookware…the best part is the tasting! The revised and limited edition of my second recipe book, Curry Me Home, Again will be on sale! Some people have been commenting and asking, ‘Where is Winter’? I say it is here already…most mornings I look like the Oros Man with layers of flannel and fleece not to mention those chunky socks. As the temperature takes a nose dive, my food cravings rocket and there is a whole lot of cooking going on at Holi Cow! Having my mom around means that I get home cooked goodness everyday. My kids and I are super lucky to have her around. Every now and then we take a curry break…we love love love our Indian food but a change is as good as a holiday….and I was dreaming of a Greek holiday when I prepared this recipe. Comfort food is always popular and a slow cooked lamb shank is the perfect fit! I often read through recipes and have to remind myself that not every recipe needs a myriad of spices. Perhaps, it is preparing Asian food that uses many spice combinations…my fingers itch to reach into my spice box. This is a simple recipe and remember to cook the shanks slowly which brings out the flavour of the meat and also improves the texture. You can toss in a few green chillies to spice it up if you like! I gave in to my spice obsession and added two tablespoons of Magic Masala to the shanks…Magic Masala is one of my special blends and the Rolls Royce spice of the Curry Me Home range. This is not a curry spice but a ‘global blend’…whether you are cooking Moroccan, Greek, Middle Eastern or Indian…a little Magic Masala goes a long way…the combination of cumin, coriander, cardamom and cinnamon make this blend hard to live without…it is best described as ‘bottled gold’. Get the shanks on and kick back to enjoy your weekend…serve the shanks with a heap of buttery mashed potato! Leave a comment so I know you popped past my blog! Heat a large AMC pot and pour in the sunflower oil. Seal the lamb shanks in a single layer until golden brown. Remove the shanks from the oil, then add the onion and saute until pale golden in colour. Add the carrot, celery and saute until the vegetables soften. Stir in the garlic and fresh thyme. Saute until fragrant, add the tomato paste, wine, stock cubes and water. Simmer on a low heat for 3 – 5 minutes, then place the lamb shanks into the pan in a single layer. Cook on a low heat until the lamb is tender – this should take about 2 hours on a low heat setting. Remove the shanks from the pan and leave aside. Pass the sauce through a strainer and use the back of a spoon to press out the liquid. Return the shanks to the pan with the strained sauce and simmer until the sauce thickens. Check the season and add salt only if necessary.